I have been wanting to try sous vide lobster for a while, so I bought a fresh raw lobster and hacked it apart. 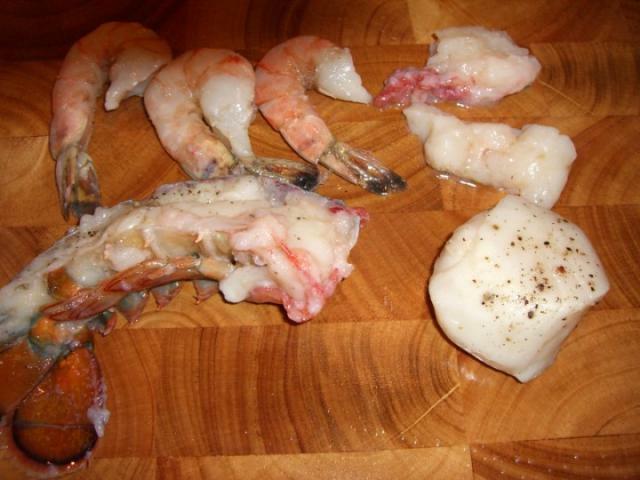 Usually when I buy fresh lobster, I boil it in the shell or cut it up and cook it in the shell. This was the first time I tried to remove the meat raw...big mistake. The lobster's flesh is essentially stuck to the shell and I have to cut the meat out by inserting a pairing fine in every nook. Next time I will steam/heat the shell for a few minutes, as has been suggested in this and other threads. 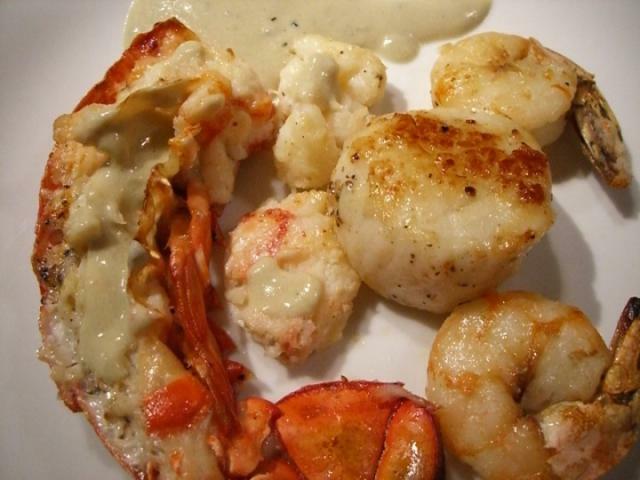 I then placed the lobster under the broiler while the shrimp and scallops were quickly pan seared. This was plated and served with a sauce made from the lobster's head, shells, mirepox, cognac, vermouth, white wine (OK, it had a bit more alcohol than usual, but I did flambé it) and cream. Unfortunately, the lobster was not a total success. It had a mushy texture to it and not as firm as the shrimp or the scallops. Maybe it needed to be cooked at a higher temp or maybe it should have gone straight into the bath instead of the vacuum bag and fridge overnight. Any suggestions? The scallops and shrimp were excellent though and the lobster tail was not bad. Percyn, you're blazing the trail and I'm simply following in your footsteps. Everything looks great. I did some duck breast today which was totally insane good, the best of my sous vide experiments before. I'll be posting pictures of it tomorrow. A rack of lamb, similar to Percyn's is up next. Keeping it overnight in the bag should not be a problem, and should not make it mushy unless you put something acidic on an enzyme in the bag. I have not tried keeping raw lobster overnight in a bag however, so maybe this is it. The cooking time seems a bit long. Lobster once out of its shell is not that thick. Going by the time / temperature tables I would expect about 20 to 35 minutes cooking time. 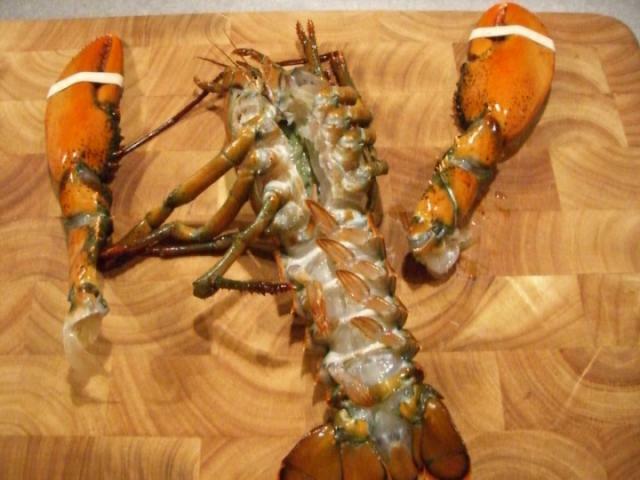 When I cook lobster I start by pouring hot water over them, then drain immediately and take the meat out of the shell. The hot water makes it easy to pull the meat out. I then bag it with butter, and put it in the water bath at 45C/113F. Since the temperature is already above the temp for the tables (5C/41F) the cooking time will be shorter than the tables say. So generally 15-20 minutes is enough.